Biographical details of Marguerite Howarth have been collected from a number of different sources. Wherever possible these sources are identified. The usual cautionary warning applies, information which is not supported by a reputable source must be treated as such and an open mind kept. Marguerite (Peggy) Howarth, a former president of Woking Art Society1 and member of Guildford Art Society1, was born Marguerite Walmsley at 72 Beaufort Street, Nelson, Lancashire on 30th November 1908 the daughter of Thomas Walmsley, accountant and teacher and Mary, his wife. She studied and taught art in Yorkshire2 until she married her husband Harold William Howarth, an accountant working for a London firm of Accountants, at Rystone on 29th March 1937. Interestingly, the Pioneer describing the wedding in company with the Craven Herald reported that the best man received a water colour painting as a present, the work of the bride. After their marriage the couple lived in a flat in Cheyne Row, Chelsea2 the dancer Margot Fonteyn having a flat above them. Initially she worked for a short time under the name Marguerite Walmsley-Howarth but soon reverted to her married name Marguerite Howarth by which she is best known4. Marguerite did some commercial art work and exhibited in several London galleries1. With her husband she moved to Good Hope, Oak End Way, Woodham at the outbreak of war and later in May 1951 to a house in Woodham Park Way, which she is said to have designed1 and named Appletreewick, after a Yorkshire village near Grassington. They moved to Wood End, Anthony’s in Woking in 1966. 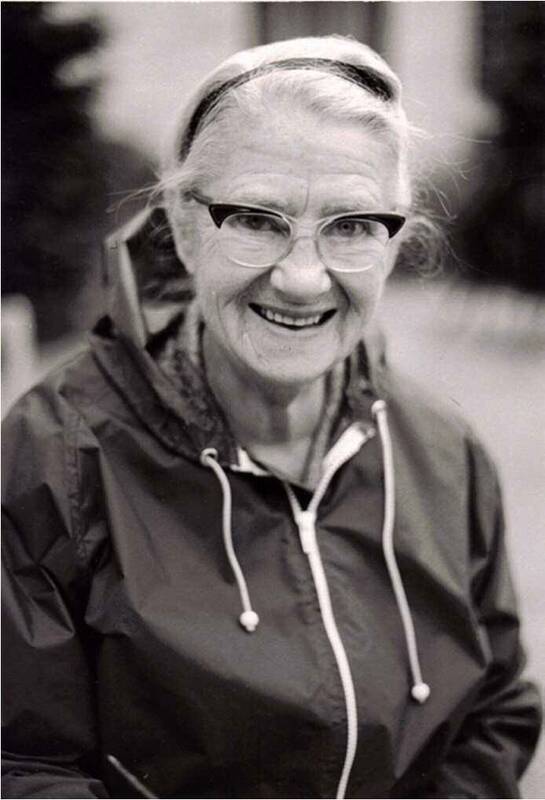 Marguerite was a member of the Society of Women Artists from 1970 to 1983. She exhibited regularly with the Society and a list of those works appears in The Society of Women Artists Exhibitors 1855-1996, Volume 2 E-K. This indicates she exhibited under their auspices between 1963 and 1980. The Society’s exhibitions today are open to stunning artwork from leading Society Members together with talented non-members and this was probably the position in 1963/9. She was a professional illustrator whose early work centred on the production of greetings cards & postcards for companies such as Medici and the Fine Arts Publishing Company Ltd. Although the Artist normally retained the copyright of her work so far as work produced for such companies the copyright would probably have passed with art work to the card company. Many of her works were subtlely signed so that her signature appears part of the work and can easily be missed. Although most of her work in the 1920’s & 30’s was greeting cards, she was an accomplished artist producing some fine drawings & etchings. During the post-World War II period she appears to have moved somewhat away from greeting cards and concentrated on architectural drawings for which she displays a real talent and understanding of perspective4. Marguerite produced a number of pen and ink drawings in the late 1950’s for the Woking Review as it described itself then, one of a series of magazines covering NW Surrey rather than a newspaper. These drawings were also used to produce a calendar in 1958. The Review reported that she had had her book plate designs at the Headquarters of the National Book League in Albemarle Street in an exhibition which included plates from the Windsor Castle library (see The Observer Ximenes prize 1951). She had also done some book illustrations for school readers. She was described as having three children and painting in her spare time while running a home single handed and spending two days a week at E.M.Potteries painting designs on pottery before it was fired and glazed. My attention was drawn to the artist towards the end of the 20th century when she was living at Anthony’s and exhibited at the displays of members’ work organised by the Woking Society of Arts6. I was attracted by her use of line to enhance the effect of her water colours. For me she had developed a style which enabled me to pick out her work as soon as I entered a room. There was too, a childlike quality to her work. If she had a fault, it was her depiction of people in her water colours. But this need not detract from the enjoyment of her pictures, after all Gwen John couldn’t draw hands! It was at these displays that I purchased three of her water colours featuring Woking, Farnham and Holmbury St Mary. Subsequently I met her and asked if she would draw some sketches of local churches for me. She said that she did not undertake commissions but nevertheless she sketched the churches at Old Woking, Pyrford, Shere and Ewhurst. I have these still. I recall she mentioned that Ewhurst was a difficult church to draw since it was necessary to do this from the other side of a busy road. At this time her output was generally confined to Surrey scenes and the occasional water colour painted whilst she was on holiday. Although these paintings were almost entirely of contemporary views, I remarked on the absence of television aerials and other urban clutter. She confessed she always omitted these preferring to show the original uncluttered scene. In the same way as John and Edward Hassell’s water colours7 provide a valuable record of Surrey buildings of their time, Marguerite Howarth’s work too represents a picture of Surrey in the 1950’s, 60’s and early 70’s although her work cannot be compared with the Hassells either in quantity or quality. Although Edward Hassell faithfully recorded what he saw, his father tended to omit features which might detract from the perfect picture. Mrs Howarth did the same but her aim was to remove the intrusion of ugly structures into the original Surrey countryside rather than to produce the chocolate box effect that John Hassell sought. On her husband’s retirement she and her husband moved back to Yorkshire to a house at 9 Bridge End, Grassington overlooking the River Wharfe. Sadly her husband died shortly afterwards. My wife and I visited Mrs Howarth after her husband’s death when we were camping at Arncliffe. At this time her water colours were understandably of the local Wharfedale countryside and she spoke of the local soft Yorkshire light which contrasted with the harsh Surrey light to which she had been accustomed in the south. About this time I purchased a water colour she had painted of nearby village of Appletreewick. This was, of course, the village after which she had named her Woodham house. She chided me for not having bought the painting direct from her and thus avoided paying the Grassington shopkeeper’s profit. I recall she was proud of a pencil sketch she had which she thought was by Augustus John and to which she drew my attention when we visited her. Living in the Yorkshire Dales although she continued to exhibit at the Annual Exhibitions of the Society of Women Artists she was too far away to visit these and she sent us viewing tickets as we were better placed in Surrey. I can just remember an exhibition at the Mall Galleries in Pall Mall. Although we visited Grassington again and I wondered if she was still around, we never called on her and eventually, she had died. Our last contact with her was when she sent me a cutting out of the local newspaper of the Kilnsey Show, perhaps a reminder of Kilnsey Crag which she drew and exhibited under the auspices of the Society of Women Artists in 1979. Marguerite Howarth died on 2nd July 2001 aged 92 years. She had by then moved to more convenient accommodation at The Square in Grassington. After a packed funeral service at Linton her ashes were interred in the church grounds overlooking the Wharfe. Marguerite Howarth’s work would appear to fall into three areas initially commercial art possibly providing an income, then pen and ink drawings and finally water colours. Interestingly she usually retained her drawings and the copyright that went with these. This was sensible since a drawing can be printed again and again whilst a water colour has no further use to the artist after it has been sold. I think too she was happiest when she was working on small drawings as opposed to the larger water colours. In her later years she turned occasionally to miniatures. Her grandson, David Statham, thinks these were either of flowers or pictures of the Yorkshire Dales especially of Grassington Bridge which she used to paint out of her drawing room window overlooking the Wharfe. There were three children, two sons John Anthony (Tony) and Peter and a daughter, Marguerite. The daughter, Mrs Marguerite Statham, the second born in 1942, later donated a pen and ink drawing of Christ Church by her mother to what is now Surrey History Centre. She and her husband moved to Dorset in 2001 where she died in 2008 at Yeovil. Her husband moved back to Woking in 2010. Anthony and his wife now divide their time between North Wales and Spain and Peter and his wife live in south west Ireland. I am indebted to Tony, Peter and David as well as Sandra Warren, her great niece for the help and information they have given which has enabled me to prepare this biographical note. I am also grateful to those who have responded to my general request for information regarding Marguerite Howarth and the whereabouts of her works. Brian Moxham of Grassington mentions that she exhibited some of her original water colours at local exhibitions and encouraged him to bring his own water colours round to her flat for a crit and advice. He comments, It was a real joy to know Peggy. Alistair Woodroffe of Pyrford inherited a water colour of his late aunt and uncle’s house, Sundial Cottage and believes they knew Mrs Howarth through their involvement with Woodham church. He comments that the picture is full of memories for him. Shirley Hand of Woking has presented the water colour of Newark Mill that “Peggy” painted and gave to her husband and herself as a wedding present to Surrey History Centre and remembers her with fondness, she was a warm kind and generous person. John Rennie found another water colour by Peggy of Newark Priory in a local charity shop. This has been photographed by Surrey History Centre and added to their collection of images. Having downsized, my wife and I have deposited our Marguerite Howarth pictures with Surrey History Centre on long term loan. The copyright of all Peggy’s images normally belongs to the Howarth family except where this has been sold with the item as is the position for art work produced for Medici and similar companies. Generally speaking use of these is permitted for non-commercial purposes provided that copyright is acknowledged. Use for commercial purposes is not allowed without the express approval of the copyright owners. 1 Woking News and Mail 17th December 2009. 2 Surviving advertising copy shows Mrs Howarth art working leaflets for the Keighley School of Arts and Craft and Chelsea Fine Art Club. 3 Rylstone was the parish church of her then home at Hetton. 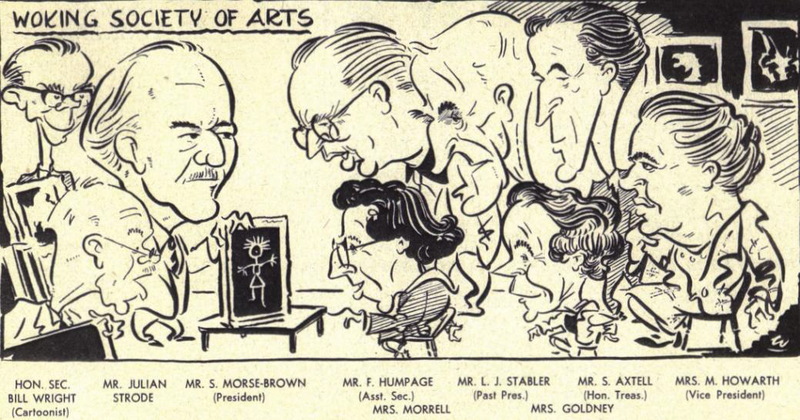 6 see Cartoon from Woking Review of May 1958. Mrs Howarth is on the right and then the Vice President. Image Woking Review. 7 John Hassell 1767-1825, Edward Hassell, his son, 1811-1852.